Having the right type of political campaign products for your campaign is an essential element to your success. 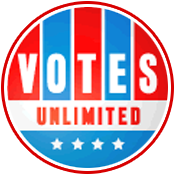 Votes Unlimited knows what it takes! For more than 50 years we have offered custom political campaign products for some of the most high-profile campaigns in history, such as the Nixon presidential Campaign, Gerald Ford, Ronald Reagan, Jimmy Carter, and George McGovern. We have also provided thousands and thousands of smaller campaigns with the custom campaign signs and products they needed to be successful. Some of our most popular items include signs, bumper stickers, pens, buttons, and magnets. We also have items such as emery boards, memo pads, lollipops, combs, and door hangers. These small tokens are critical in catching the quick attention and interest of your target audience. Review Stream Powered by OMG National | © Copyright 2019. Votes Unlimited. All Rights Reserved.